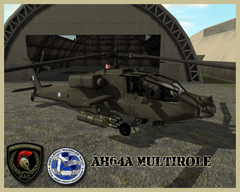 Hellenic Warfare Mod is a total conversion mod for Armed Assault. The mod is trying to bring Greek modern army into Armed Assault. A whole new set of Vehicles, Units, Weapons, Objects, GUI, sounds and even islands based on real geographical terrain data of Greece, and many more. A whole new campaign (fictional) divided into two phases (sub campaigns) for maximum game play enjoyment, along with a lot of stand alone missions, both for single player and multiplayer all of them featuring Greek modern army. Currently the mod is at development phase, estimated time of release currently unknown. For more information and progress releases you can visit the mod page. 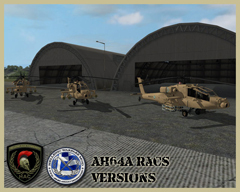 After a long development cycle we're pleased at last to release our 4th addon pack containing the AH64A in 3 different versions, in Greek, Us and RACS. This pack also includes a selection of Markers that can be very useful for the mission makers. 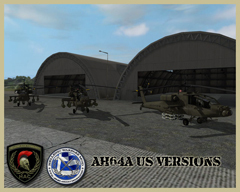 Also as we've promissed we've made all the Air vehicles (AH64A/UH1H) compatible with XEH. We've also created a special pbo installation structure that can be more flexible as far as the modfolders (refer to the manual for more installation information). 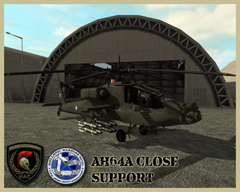 This pack was the hard effort from a combination of people, except for us the core team (Aplion, Mainframe, Liongreek, Sparky, AnzacSASSteve)in this pack Dr Eyeball got involved in order to create the amazing MFD/TADS/FLIR/IHADSS system and bring our AH64A closer to the real thing. Also for the first time in this pack people can sample sounds from our Sound Engineer AnzcsasSteve in his first debut in HWM. All weapon and Air Vehicle sounds have been replaced with new ones. This Pack is offered in 2 different ways. 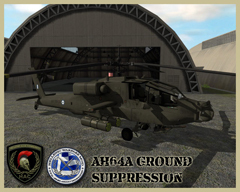 1)The whole addon Pack 4.0 in a .7z can be found in HWM website Download Section, in Addon Pack category. Refer to the Manual inside the .7z for detailed installation instructions. Furthermore we would like to thank BIS for creating this game and give us the opportunity to create this mod, and all the community for useful feedback and support so far. In our future plans for ArmA, we have already focused on the next 5th Addon Pack which will probably be the last for ArmA.Soon you'll have the opportunity to find more about it. 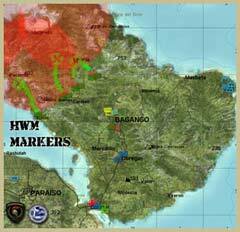 The new HWM addon Pack is out, with new features and updates on the previus. Hell ya! I love you! Τι έγινε ρε παΐδια; γιατί μας καταστρεφετε την ψυχολογία; πεθάναι το mod? θέλω κιαλο!!!! you need 7zip or winrare in order to unpack it. both of them are freely distributed in the internet. Kai gamw ta updates!Psifismeno sta sigoura!Keep going! Great Mod, great team. Go on boys. I love this mod. :) Models and textures have great quality. Eyxarhstoume, sthn pragmatikothta den eimai enas.. eimaste mia omada 3 atomwn. Ok then!Mpavo se olous kai sunexiste thn kalh douleia!